The Anthurium is native to Columbia, and belongs to the family Araceae which includes more than 100 genera and about 1500 species, mainly from the tropics. Anthuriums, also known as Flamingo flowers and pigtail plants, are tropical plants that can be grown as houseplants. these flowers are extremely pleasant for gifting purposes. since their bright flower is attractive. 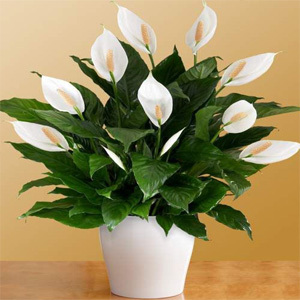 The Peace Lily can have different meanings, such as hope, peace, purity, prosperity and innocence. This plant's genus is Spathiphyllum, which is a Latin word that means "peace and prosperity." It is a sympathy flower that symbolizes a deceased person's soul as being in a state of innocence and peace. In Christianity, the white peace lily plant is a symbol associated with the Virgin Mary.